A couple of weeks ago we converted our office/guest room into a family craft studio (pictures coming soon!). While it still serves as an office for Tomas and me, it’s now become the go-to place for the whole family. You’re bound to find one or all of us in the room at any given hour of the day and evening. I’m finding one of the best by-products of this change is that there’s a steady stream of creative energy flowing. Today, Maggie was working on a Fall project for school and experimenting with different ways to use leaves in her cover page. 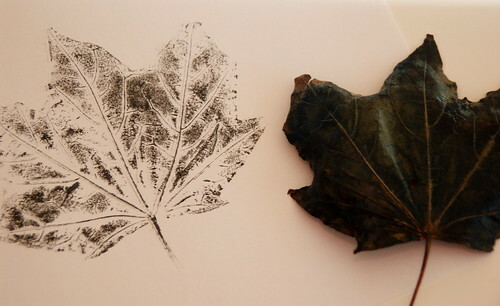 One experiment was this simple leaf print. Very easy to do: she just coated her leaf with ink using a sponge, placed her leaf ink side down on the paper, covered it all with a catalog, and pressed evenly across the entire leaf. I love the effect even though she did not, thinking it looked too much like a computer print out. I think it looks awesome!! I am going to have to try it. Maybe on a card with a smaller leaf. Free stamp right there.